The Alameda fast-food joint reclaims the much-maligned chicken tender — with an assist from Japan. Lola's fried chicken is juicy and flavorful, thanks to a marinade that contains koji. Hours: Mon.-Sat. 10 a.m.-9 p.m., Sun. 11 a.m.-8 p.m. These days, there's probably no single food item that has been more widely denigrated by the food cognoscenti than the boneless skinless chicken breast. Despite the mass appeal of all-white-meat chicken, you'll hardly ever hear another cut of meat dissed by as many chefs and food writers (yours truly included) as boring or passé. So what to make of a new restaurant whose entire stock in trade is the "hand-breaded chicken tender"? Lola's Chicken Shack, which opened in Alameda about two months ago on Park Street, in the long-empty former location of the Boniere Bakery. It's a fast-food restaurant, basically. But it's also a family-run place, owned and operated by longtime Alameda residents Mark, Nancy, and Ryan Rogers, and the chicken is cooked to order and tastes a hell of a lot better than what they serve at [insert name of popular chain here]. Like any self-respecting theme restaurant, Lola's is decked out with kitschy artwork: a chicken piloting an airplane; a chicken playing chess against an elephant; and three beret-wearing, Breton stripe-rocking chickens with cigarettes hanging from their lips. Old-timers on the island wax nostalgic about a fried-chicken joint called Lola's from some thirty years back. To be clear, this Lola's has no connection to that one, except perhaps in sharing some nugget of chicken-frying juju. (Ryan Rogers said the new Lola's moniker is a composite of two of his nieces' names.) 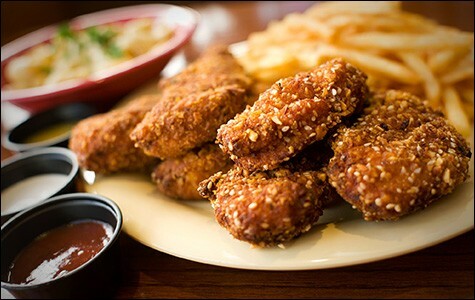 But while the original Lola's served skillet-fried chicken in the Southern mold, this incarnation takes the breaded chicken tender and elevates it with a secret weapon from Japan: koji, or mold-inoculated cooked rice, which is then mixed with water and salt and allowed to ferment. The Japanese use koji to make everything from sake to soy sauce, and the ingredient has recently become trendy at forward-thinking American restaurants — used to marinate meats and pickle vegetables everywhere from San Francisco's Bar Tartine to David Chang's New York City-based Momofuku empire. I've even seen it touted in some quarters as "the new MSG," as a result of the extra burst of umami it adds to dishes. At Lola's, the cooks let the koji mixture ferment for at least ten days before marinating their chicken in it. Rogers said he and his parents started experimenting with the stuff after reading an article about it, and they found it yielded far juicier, more flavorful results than traditional marinades like buttermilk. And it's true: Bite into a fried-chicken tender at Lola's, and the first thing you'll notice is how tender and moist the meat is — a tenderness that lasts even as the chicken cools down. With almost every item you order at Lola's, you're given a choice between three kinds of chicken — Classic, Signature, and plain-old Grilled — which you can mix and match as you please. The restaurant might want to consider coming up with more distinct names than "Classic" and "Signature," as I found it impossible to remember which was which. 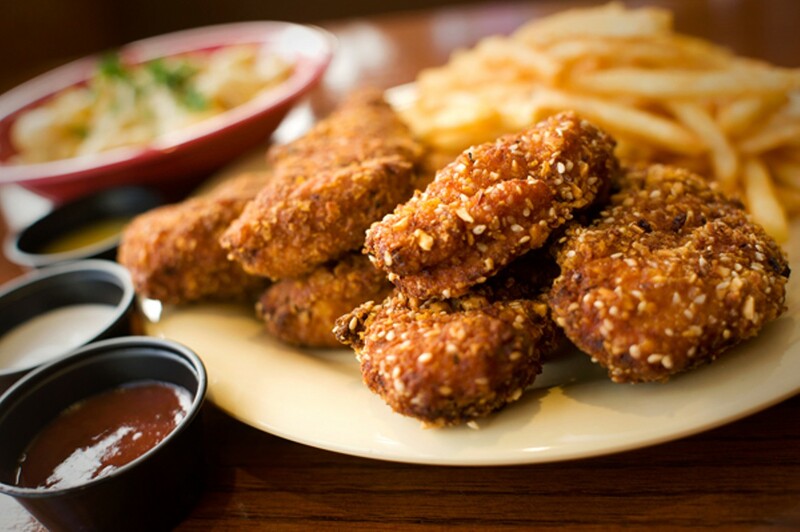 For the record, the Classic is a fairly traditional fried-chicken breading — slightly spicy, with crushed corn flakes for extra crunch; the Signature breading isn't quite as crispy, but, flecked with sesame seeds and chopped almonds, it's the more interesting of the two, flavor-wise. Unless you're philosophically opposed to fried foods (in which case this is probably the wrong restaurant for you), you should avoid the grilled tenders, which came out burnt-tasting and significantly drier than their breaded-and-fried brethren. The restaurant's other selling point is its lineup of eighteen dipping sauces, almost all of which are made in house, running the gamut from the typical (ranch, honey mustard, etc.) to ones that sound slightly more "gourmet" (e.g., chipotle mayo). The honey mustard was damn good, as was a complex roasted-strawberry barbecue sauce — echoes of homemade jam without being excessively sweet. Ask for a few different dips. Variety is at least partly, if not mostly, the point. On the sandwich front, the "Lola's Signature" was what anyone who has ever had a chicken sandwich at Bakesale Betty, or sampled any of the countless copycat versions, will recognize as an "Oakland-style" fried chicken sandwich: boneless fried chicken atop a bed of spicy coleslaw, all served on a soft roll. The chicken didn't have as crunchy a batter and wasn't portioned quite as generously as it is at Bakesale Betty (though it was juicier) — but the sandwich scratched the same itch, at a lower price point and without having to stand in a line for six thousand years. On the other hand, it might be advisable to pass on the more gimmicky-sounding sandwiches. The chicken-and-waffles sandwich (chicken tenders, bacon, lettuce, and tomato served on a green-onion waffle) was easily my least favorite of the items I tried: The sandwich was a spruced-up BLT, basically, whose chief sin was the fact that the waffles (which replaced the bread) were flabby and lukewarm. Lola's also serves a decent salad with chicken — that pseudo-healthy lunch option I'd largely given up on for fear of the sawdust-y taste and texture I associate with grilled chicken breasts. Here the fried chicken was tender and juicy, and the dressings are culled from the restaurant's lineup of uniformly excellent dipping sauces. But in the Cobb salad I ordered, the lettuce seemed like it'd been sitting in the back of the fridge for a while, and generic black olives (an inexplicable addition) clashed with the classic components of blue cheese and avocado. Most of the combo meals come with a side of well-seasoned, crispy French fries, but the best side dish at Lola's is the mac 'n' cheese — big pasta shells cooked al dente, a super-creamy three-cheese sauce, and bits of smoky bacon. Since so many of the dipping sauces were sweet, it was nice to have something deeply savory to round out the meal. Because of its proximity to both the local high school and the movie theater, at certain hours Lola's is filled almost entirely with teens. I never saw one of them order a salad. But, at seven or eight dollars for a meal that was at least reasonably healthy — as far as fast food goes — they certainly could do a lot worse.